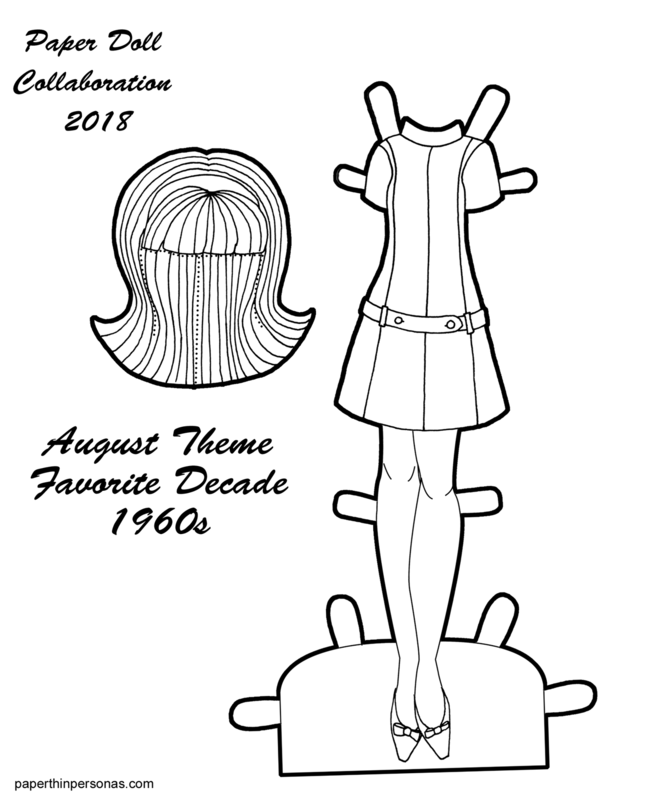 Black and White Paper Doll PDF Paper Doll Collaboration 2018So, the theme for August was Favorite Decade and I almost did the 1920s, because as you know, I love the 1920s so much. I just adore that era. And you know, I have been drawing a fair bit of 1920s stuff for my 1920s Akiko. Then I thought about other decades I really love- the 1880s and 1960s. Trying to draw a bustle dress was, frankly, more than I thought I could handle this month. Between my allergies (thanks Ragweed) and the start of school again (Hi, students), I just didn’t have the complex layers of the 1880s in me. I did, however, have a simplicity of a 1960s shift dress in me. Today’s 1960s dress is based on Simplicity 7587 from 1968. The dress came in two lengths. Her shoes are based on this pair from 1962. And, of course, she has a big flipped hair style which you may need to add some floating tabs too. If you want to see more “favorite decades” head over to Paper Doll School and Miss Missy Paper Dolls to see their August posts. I have no idea what decades they chose and I am looking forward to seeing myself. Meanwhile, back in April, I started a project to draw 100 dresses and post my drawings on Instagram. It was more about completing my #100dressesproject than any kind of timeline. Of course, I did take a few weeks off in the middle. However, I am super happy that I posted dress 100 today! So, go check out all 100 dresses and let me know what you think of them in a comment there or here. And, as always, I’d love to know what you think of today’s 1960s paper doll dress. There’s a second, patron exclusive, 1960s dress over on my Patreon page. So, if you are a patron (thank you) and enjoy! If you aren’t a patron, consider joining. Any amount really does help keep the blog’s costs down. Need a paper doll to wear these clothes? Grab her and more clothing here. Printable Black & White PDF Printable Color PDF More Paper Dolls & ClothesSo, I tend to work in spurts. I suddenly decide that I want to draw 1930s clothing (as I did recently) and then I draw several and then I don’t draw any for months. This is just how I am. I try to build enough of a backlog that I can space out these posts in such a way that people who want to see 1930s clothing don’t feel disappointed when it takes months for it to show up again. Today’s dresses are both appropriate for any 1930s paper dolls out there. I used my favorite source for these things- The Vintage Pattern Wiki. It’s amazing and so fun to dig through (if you’re a clothing lover like me.) So, the dress on the left is based on Simplicity 1091. Unfortunately, I didn’t have a way to see if there was a more precise copyright date on the pattern other then the cover art which is distinctly 1930s. The second dress is based on Vogue 7316 C from 1936. The hats and gloves are based on a variety of sources, including the pattern covers. In my head these are summery dresses, but I suppose there’s no reason they have to be, through the one on the right would be awfully cold come winter time. The 1930s Paper Doll Collection So Far..
I’m excited to say that I just drew a new set of 1930s underwear and so soon there will be a second 1930s paper doll to join Benedita. Of course, given my turn around times, “soon” might equal sometime in the next six months. I am a bit slow at these things. Meanwhile, the 1930s dresses will fit any of the B Pose dolls, they just might back the right shoes and hair for a period look. As always, I love to hear from you guys, so leave a comment and a huge thank you to my Patrons and if you’d like to help out the blog by making a donation, you can do that over on the Patreon page. 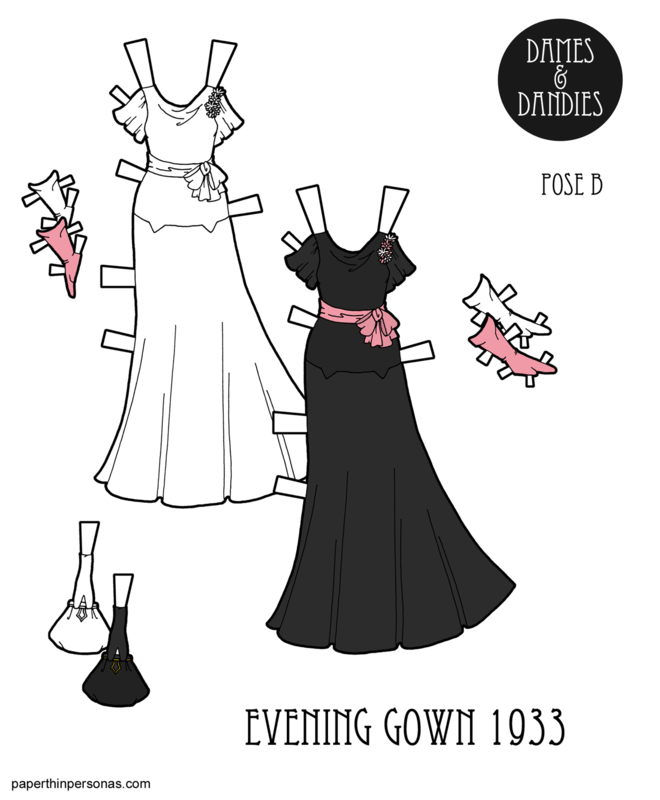 Printable Black & White PDF Printable Color PDF More Paper Dolls & ClothesSo, I knew when I was working on a 1930s paper doll collection, I was going to illustrate some a 1930s evening wear. Day wear is important too, but I have some of that and evening wear seemed like the next step. I rarely do black evening gowns, because I think the line-work gets lost, but I really liked the idea of black and pink for today’s paper doll dress. So, this attempt at 1930s evening wear is a complete outfit for a lady, except shoes. I didn’t want to deal with strappy 1930s shoes and the skintone. The evening gown is based on Butterick 5095 a dress pattern circa 1933. I designed her gloves like on the pattern illustration, but lest you think pink gloves are a little odd- here’s a pair of purple ones. Her purse is based on this beaded evening bag from 1930-1935. If you’re thinking that you need a paper doll to model today’s slinky black evening dress, than might I recommend Benedita’s 1930s Version? She even has period underwear. If you’d like to support the blog, think about donating through Patreon. It really does help keep it up on the internet and ad free. I think of the blog has having the NPR marketing strategy. Maybe, if people like it, they’ll help me off set the costs. Speaking of NPR, if you haven’t seen it, the Mr. Rodgers documentary Will You Be Me Neighbor? made me cry. It’s not a perfect movie. It had some flaws, but I really really enjoyed it. So, I highly recommend it if you haven’t seen it yet. Printable Black & White PDF Printable Color PDF More Paper Dolls & ClothesSince I am a librarian, I would be neglectful if I didn’t start out with some sources. Today’s 1929 paper doll dress is based on the design on a sewing pattern from McCall. Specifically, McCall 1517 and it’s very much the end of the 1920s. The skirt lenght is a short as it would get, right below the knee, before it drops in the 1930s to mid-calf. The long narrow neckline with collar detail would have been elongating and flattering. The feathered hat comes from Liberty of London in 1928 and was based on this one held at the V&A Museum. It’s one of my all time favorite 1920s hats. Her other cloche was inspired by several different hats including this one and this one. I find hats and purses are a bit harder to research than dresses and shoes. I’m not entirely sure why, but I think fewer of them seem to have survived. Plus, there’s always the question of how to decide what sort of hat goes with what sort of dress. It’s something I probably fret more about than is entirely needed given my medium is paper dolls and I’m not in charge of some sort of exhibit on the topic. This is the last 1920s dress for a while. I have one more, but it is not entirely finished yet. I don’t think it’ll be done for Monday. 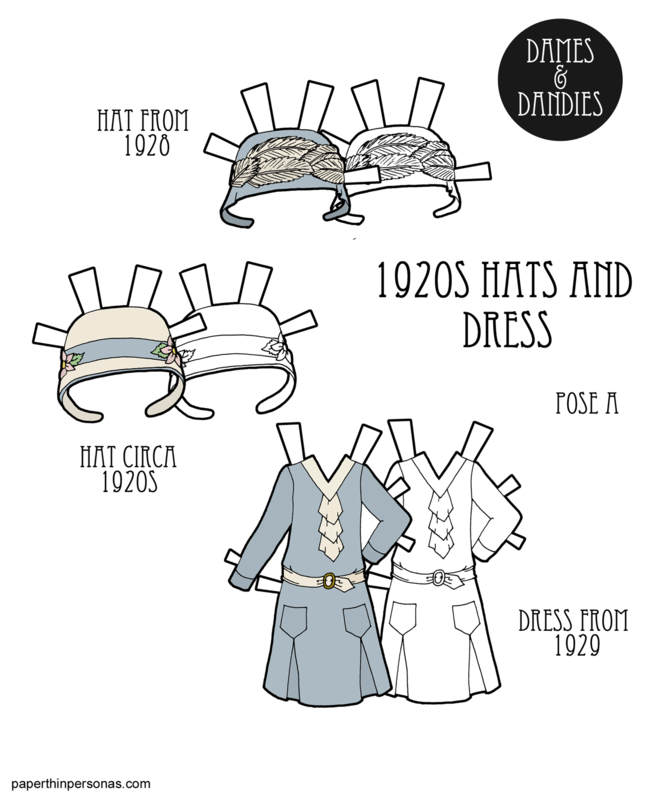 Meanwhile, you can print out 1920s Akiko and her other dress to keep you occupied with 1920s styles. Come back Wednesday for something for the B Pose ladies from the 1930s. I’m trying to decide which decade I could tackle next. I’ve done 1920s, 1930s and 1940s at this point. I am currently divided between the 1950s and the 1960s. Thoughts? Let me know in a comment which one I should do next. Printable Black & White PDF Printable Color PDF More Paper Dolls & ClothesAs promised, today I have a 1920s dress to accompany poor Akiko from last week who needed something to wear over her slip and girdle. Today’s 1920s paper doll dress and hats are from Montgomery Ward Fashions of the Twenties edited by JoAnne Olian. The book is a selection of the 1927 Montgomery Ward catalog. I wouldn’t recommend it as anyone’s only 1920s book, because it only covers one year. However, 1927 is a good year to choose, because the later 1920s are what most people picture when they imagine 1920s styles. Also, the late 1920s are my preferred part of the decade as well. 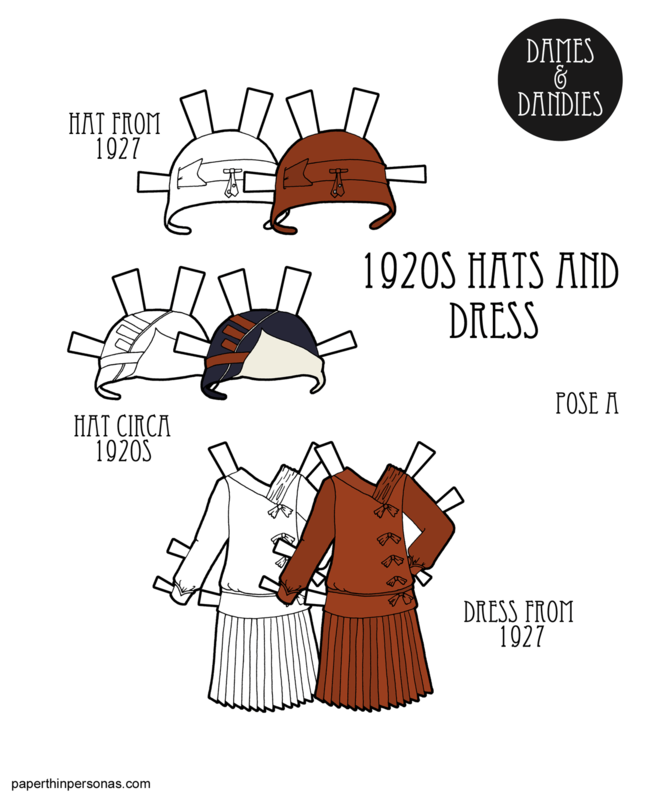 I really wanted the hats to coordinate with the 1920s paper doll dress. And if you hop back to Akiko from last week, you’ll see one pair of her shoes match the colors in this dress as well. Part of why I chose this dress to draw is that I liked it, but also because it has so many elements that are typical of the late 1920s. There’s asymmetrical design elements- the neckline and the bows. The line down the side of the body would be flattering on body. And given how hard the dropped waist look of this era was to wear, you need any help you can get. I also really like the pleated skirt. Pleated skirts were pretty popular. I think, because they provide some movement in a silhouette that can feel a bit like you’re wearing a sack otherwise. I’ve always wanted a pleated skirt, but I haven’t found the right one yet. I love 1920s fashion. I love the shapes of the dresses, the hats and the shoes. Seriously, I would wear most late 1920s shoes today if I thought I could get away with it. I love the the hair, the art and the literature. I also realize that I would look awful in 1920s dresses. I have curves and this was the era of no curves. But that’s what paper dolls are for though, isn’t it? 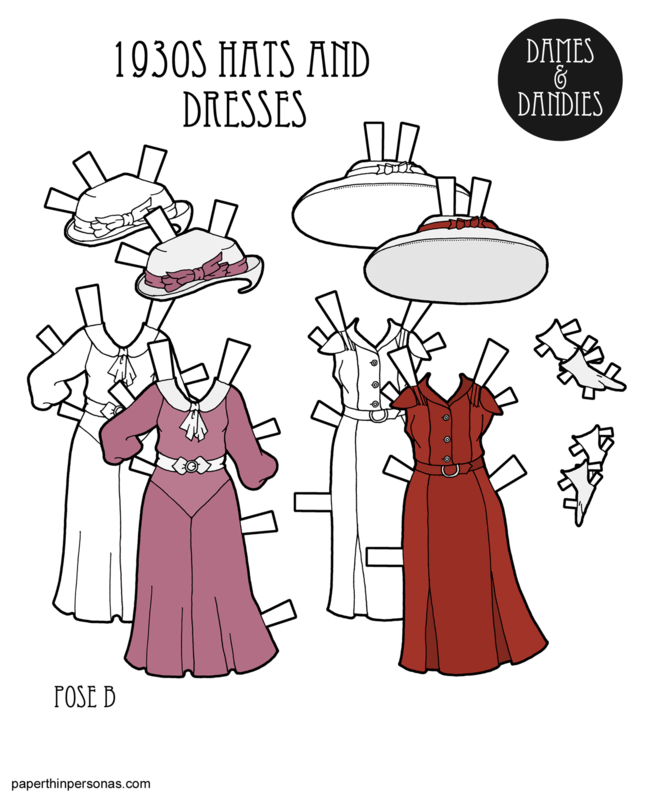 So, for every Monday for the rest of July there will be a 1920s era paper doll or dress (okay, so one paper doll- this one and then dresses). Akiko is the model for the 1920s underwear. Her hair is based on the hair cut often sported by Anna May Wong, a Chinese American film actress in the 1920s. She was also considered a major style icon, so borrowing her hair style seemed only fitting. Her undergarments are not entirely accurate. I based her slip on this brassier from The Met without realizing that the cut of the top was not very accurate for a slip. Slips of the era were mostly straight across like this one from the V&A. Anyway, her girdle is based on designs from the early 1920s from my various reference books on the subject. Her black shoes are based on this pair of evening shoes from 1924. The originals are brocade, but I made mine simple so they’d match more things. The other shoes are based on these shoes from 1920-1925, these shoes and these shoes. That’s a lot of shoes, but we all know how much I love shoes. If you want to see more 1920s shoes, underwear and dresses than I would recommend hopping over to my 1920s Pinterest board where those things live. If you think you’d like some more 1920s paper dolls than I’ve got quite a few in my 1920s category. So, tune in next Monday for the first dress for the A Pose Dames from the 1920s. And if you would like to support the blog, then donate through Patreon. It’s always appreciated. Printable Black & White PDF Printable Color PDF More Paper Dolls & ClothesI posted the prompt on Facebook, the Patreon Page and here to ask me a question and that I’d answer it in a blog post. So far, Melissa and Laura Jay have taken me up on it. Laura Jay asked: Where do you get your inspiration? Well, Laura, that’s a short answer to that and a long answer. The short answer is: Everywhere, but mostly Pinterest. The Long Answer is: I believe inspiration is a myth. We become inspired by doing. Don’t know what to draw? Just start drawing. Don’t know what to cook? Just start cooking. The word ‘inspiration’ conjours images of fairies who come and provide the perfect idea. There is no perfect idea. 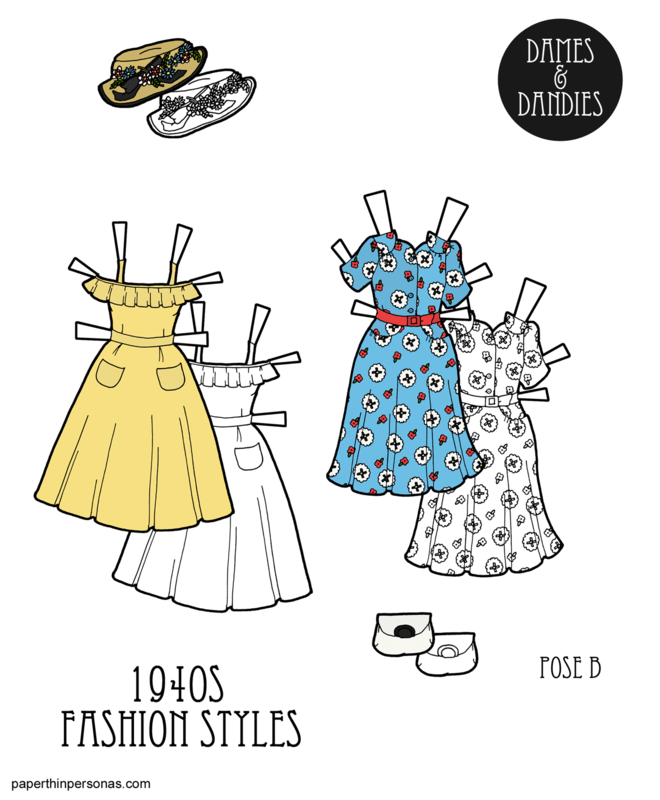 Take today’s 1940s paper doll dresses. The sources were Simplicity 1628, McCall 4280, and a hat and purse from The Met. But those weren’t what inspired me in the first place. What inspired me in the first place was that I drew the straw hat, because I was looking for 1940s hats and I thought it was super cute. But I didn’t think it went well with Wednesday’s dark eggplant dress, by the time it was done. So, I decided to draw a pair of summery dresses to go with the straw hat. That meant pouring through the Vintage Pattern Wiki until I found two dresses I liked- McCall 4280 came first and then Simplicity 1628. Once they were done, I realized I needed a purse or something and I went looking for a 1940s purse that felt summery. I was completely unsuccessful and on a deadline, so I used this purse and made it white. I still think that was cheating a little. I store all the things I see on Pinterest boards, like my 1940s fashion one. I’m not sure I did a very good job answering your question, but I hope I gave some insight in how my brain works when I’m putting together a set. Meanwhile, don’t forget that on Monday there was a 1940s paper doll to go with today’s 1940 dresses and Wednesday there were two other dress options. Meanwhile, let me know what you think of today’s dresses in a comment whenever you have a moment and if you’d like to ask me a question, please do!